What does the world look like ‘after’ coal? It goes without saying that the industry in Wales certainly isn’t what it used to be. When the industry employed a vast majority of working men in Wales, it provided cultural, social and economic growth in valleys across the country. A central component to transatlantic analysis of coal stems from the understanding that Wales’ western coalfields are, indeed, in a state of ‘after coal’. This differs from their Appalachian equivalents that are still very much ‘with coal’ and at the start of their journey of transition. People sometimes forget that the decline in the Welsh industry began as early as the 1910s, and not as a result of the eventual death knell sounded by a certain Mrs Thatcher. During this period production peaked and more than 57 million tonnes of coal were produced by 232,000 men working in 620 mines. The inter-war years saw a recession in the coal industry as a result of overseas expansion and the industrialisation of poor, un-unionised territories where labour was cheap and resources were plentiful. Added to this was the shift to oil power in shipping and the naval Armed Forces. Despite a resurgence during the 1970s oil crisis, production continued to decline, and not even industrial action led by the most powerful workforce in the world, in the shape of the 1984/85 Miners’ Strike, was enough to counter the terminal blow from Prime Minister Thatcher. 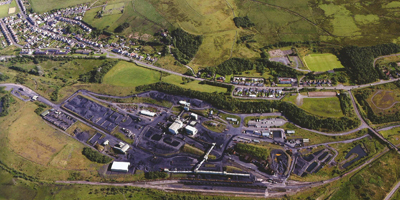 Onllwyn Coal Washery and adjacent village. Whilst the above description continues to be the mainstream understanding of the ‘life’ of coal in Wales, it does not mean that the industry is completely dead, and many communities across Britain, Neath Port Talbot in particular, still rely heavily on King Coal. This reliance not only manifests itself in terms of jobs, but also in terms of the energy that fuels the power stations that produce the electricity that boils the kettles in kitchens all over Wales. However, the numbers presented below perhaps demonstrate a dichotomy of reliance as the necessity of coal as energy isn’t matched by the production of coal as provider of jobs. In 2012, the United Kingdom imported nearly 45 million tonnes of coal from countries as far away as Colombia, Russia, South Africa and the United States of America, some of which was used domestically to heat homes. The majority was burned in coal-fired power stations. Our evident consumption is not matched by production, though, and in the 47 UK-based coal sites (underground and surface mining) a paltry-in-comparison 12 million tonnes was returned during the same period. Nevertheless, the coal industry in Britain continues to directly provide over 6000 jobs, 1100 of which are in Wales. In Neath Port Talbot, eight sites (five surface and three underground) produce over 72,000 tonnes of coal a month and create almost 800 jobs. This doesn’t include the Powys-based Nant Helen Opencast, which borders several Neath Port Talbot communities and provides an additional 130 jobs. Whilst the industry in the UK may well be on its deathbed, our consumption of coal is alive and kicking, and the positive impact that jobs have on a community is evident. Together, this continued reliance on coal paints a picture that cannot be ignored. Dean Cawsey chats with the After Coal production team before a formal interview. We use a tremendous amount of coal but actually produce relatively little, despite the obvious benefits industry jobs bring to an area, as well as the reduction in the carbon footprint of coal mined and burned in Wales as opposed to, say, mined in Colombia and burned here. The argument for such a situation is always cost, and whilst the direct price of foreign coal may make economic sense, we are yet to know the real cost of energy dependence, de-industrialisation, continental logistics and global eco-systems. Perhaps what is needed, in Wales at least, is a re-examination of the feasibility of mining Welsh coal, and what that would bring to the economic and social regeneration of our communities and the country as a whole. At a time when unemployment is at its highest in decades, the Westminster Government is hell-bent on implementing welfare reform which has the potential to decimate families, and good quality jobs are at a premium, the idea isn’t as crazy as it might first sound. 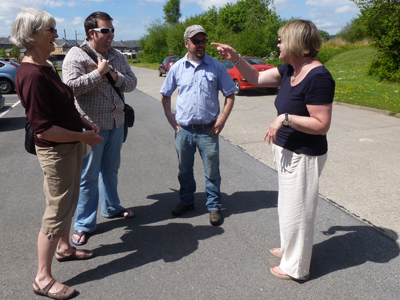 With thanks to Keith Jones, Manager of Onllwyn Coal Distribution Centre for help in researching information and statistics.